Gills free, close to crowded, relatively broad, at first pallid, then pinkish-buff, at maturity chocolate-brown; edges lighter than the faces; lamellulae in four to five series. Stipe 5-12 cm tall, 2.0-3.0 cm thick, with a cottony central core, equal except for a bulbous base; surface of apex more or less glabrous, lower portion with appressed, scattered, white to yellowish-tawny fibrils; veil two layered, consisting of buff, cottony-floccose patches arranged in a cog-wheel pattern over a white, fibrillose under-layer; annulus superior, pendant. Spores 7.0-9.0 x 5.0-5.5 µm, oblong-elliptical in face-view, slightly inequilateral in profile, i.e. with a curved and flat side, smooth, moderately thick-walled, hilar appendage conspicuous; spores dark chocolate-brown in deposit. 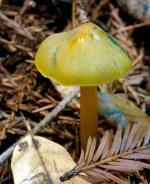 Solitary or in groups in mixed hardwood-conifer woods, often associated with Picea sitchensis (Sitka Spruce); found from Mendocino County northward along the coast; fruiting shortly after the fall rains; occasional to locally common. 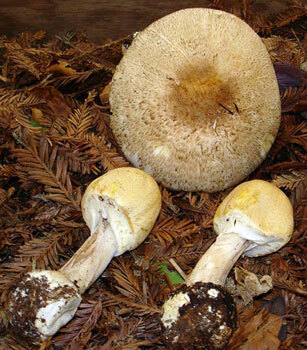 Like other members of the "Arvensis group," Agaricus smithii has an almond-like odor and bruises slowly, persistently yellow. Agaricus augustus, the Prince, is a close cousin distinguished by larger size, darker brown cap scales, and lack of a bulbous stipe base. The two species also have different fruiting seasons, Agaricus smithii from late fall to early winter, Agaricus augustus, spring, summer and early fall. It would also be possible to confuse Agaricus smithii with Agaricus perobscurus. This faintly anise-odored species fruits during the winter months, but it has a darker brownish cap and lacks the bulbous stipe base. Lastly, Agaricus smithii should be compared with Agaricus silvicola. While similar when young, at maturity Agaricus smithii develops yellowish-brown to tawny, flattened cap scales, the cap of Agaricus silvicola normally remaining appressed-fibrillose. Additionally, the spores of Agaricus smithii are almost two microns longer than Agaricus silvicola.